It was a great day at the Sunday farmers market today! I got so excited about my purchases that I had to put them to use the minute I got home! 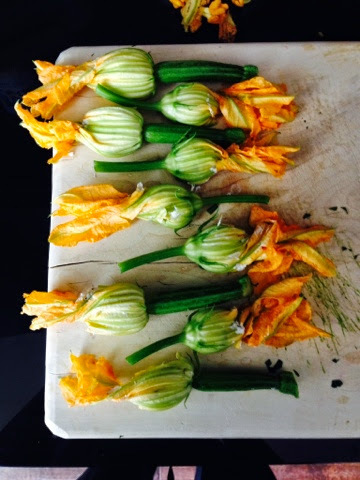 And with squash blossoms you really do have to use them the day you buy them as they are extremely delicate. I also found some edible flowers that make any salad really pop! And they don't have a strong flavor so they go with any type of salad. 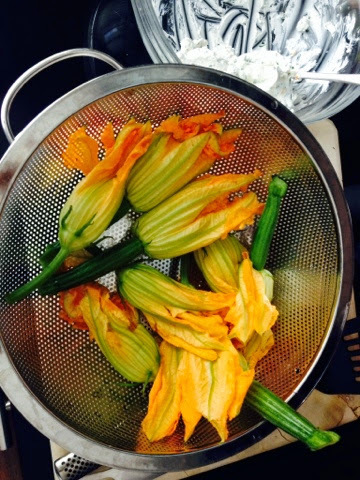 I was inspired by a restaurant I went to a long time ago in Silverlake (can't remember the name of it) that had a seasonal menu and I ordered the stuffed squash blossom appetizer which was the first and only time I'd had them. Needless to say, they haven't left my mind. Finding fresh ones in good quality can be challenging but luckily not today! 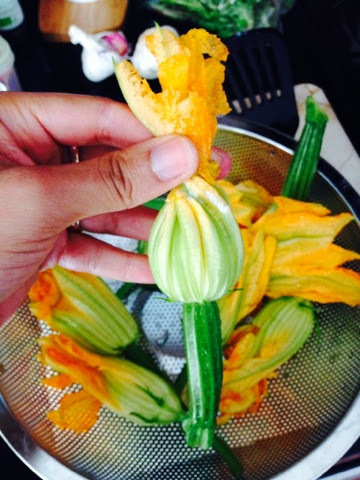 An added bonus is if you get the female blossoms with the baby zucchini attached! remove any stigmas (where the pollen comes from) from inside the blossom. Wild rocket, roasted beet and lemon juice vinaigrette(juice of 2 lemons and a splash of olive oil) to serve. Heat the olive oil in a large skillet and quickly fry the garlic till light brown. Turn off heat and scoop all the garlic out with a slotted spoon and put in a bowl. 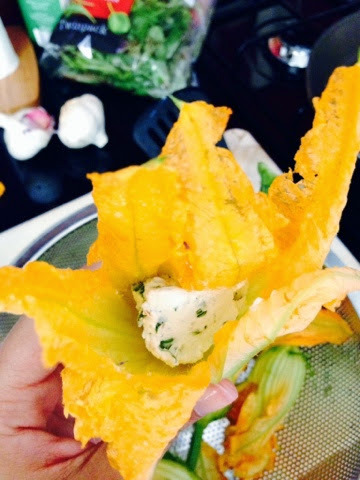 Save the now garlic infused olive oil in the same pan to pan fry the stuffed squash blossoms later. Now, mix the goats cheese, parsley, basil and salt and pepper with the garlic till well mixed. 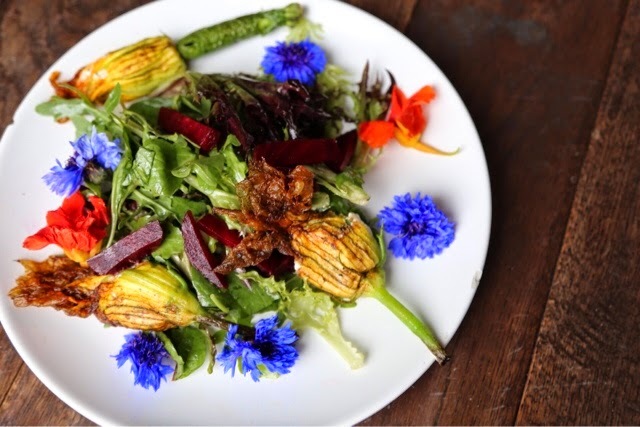 With a small spoon, scoop about a table spoon amount of the goats cheese mix into the base of each blossom then gently twist the tops to close. It's ok if there is a little bit leaking out of the sides just try to wipe it away if there's too much leaking. 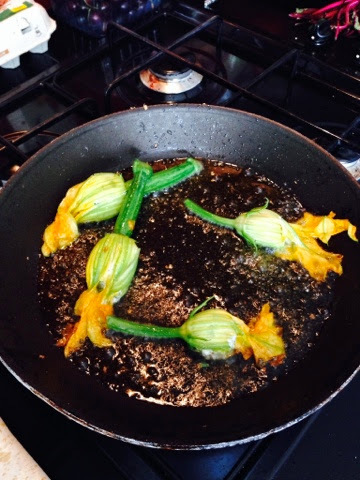 Heat the oil again till hot and place about 4-5 of the stuffed blossoms in gently. There will be some popping so be careful! After about a minute, use tongs to flip each blossom and repeat till desired brownness. Remove and set on a paper towel to soak up excess oil. I also gently pat them on top with a paper towel. 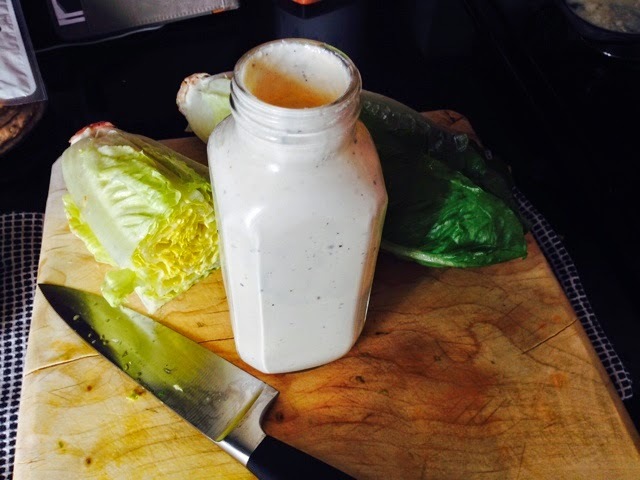 Greek yogurt caesar dressing- only 55 calories per 2 Tbs.! I absolutely LOVE Caesar salads but often have trouble finding a good one at restaurants or even a nice bottled dressing at the store. I'm definitely not a fan of bottled dressings in general as they are filled with too many additives and just taste plain weird. But, I was always a bit shy to make my own caesar because the thought of using raw egg. Well, I had an epiphany the other day, a Greek yogurt epiphany! So I whipped out my blender and threw in the classic Caesar ingredients EXCEPT for the mayo or raw egg but used Greek yogurt instead. I also tried adding lemon zest because I like and lemony dressing and the turn out was perfection! It's everything I could dream of for the best caesar dressing. Creamy, tangy, rich and not to mention healthier than any caesar dressing out there! And since I just chucked al the ingredients into the blender, it was a snap to make! Using 0% fat fage total Greek yogurt cuts calories and adds healthy probiotics along with perfect texture, it's a win win for everyone. Don't be afraid of the anchovy either! I'm not particularly an anchovy lover but they are what gives the dressing that unique caesar flavor. Plus they're high in calcium! 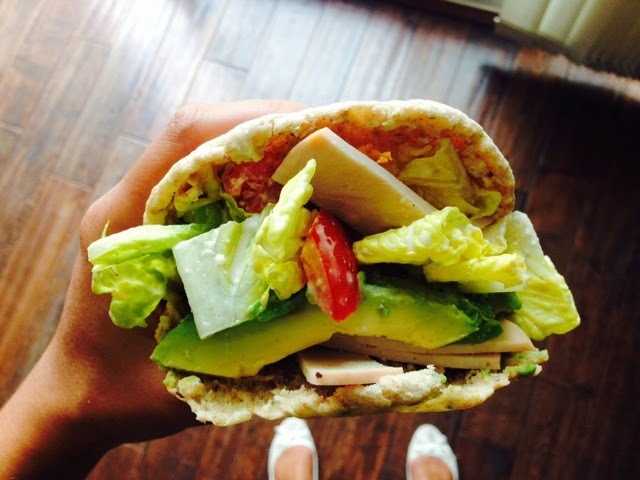 Caesar and turkey pita pocket. 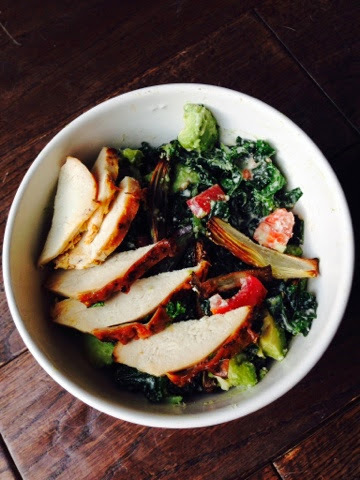 I made an incredible kale Caesar salad first (massage dressing into kale and let sit for at least 30 minutes) and have literally had a different version of Caesar salad everyday for the last 3 days. I'm a little obsessed....but you will be too. Place all ingredients into blender and blend on low till smooth. Keep refrigerated. Easy peasy! Thanks to an awesome sale at Debenham's I finally got my hands on a set of 4 mini Le Creuset casserole pots! Being a breakfast lover, the first thing I wanted to try was a baked egg pot. It's super simple to put together and they're perfect for a homemade brunch that is sure to impress. I basically used what I had in the fridge which is handy for making room for my usual big sunday shop. All the ingredients I used happened to work so well together but feel free to experiment with your own egg pot. Just make sure you layer it with veg on the bottom, cheese in the middle, then protein and finally the cracked egg on top! Voila! Pre heat oven to 200c or 400f. In a small non stick pan, sauté the tomato, asparagus, spring onion, thyme, parsley and old bay spice, salt and pepper in the olive oil. When it starts to look like a chunky sauce, split the mixture between the two mini baking dishes. Scoop 1 Tbs of the cream cheese on top of the tomato mix. 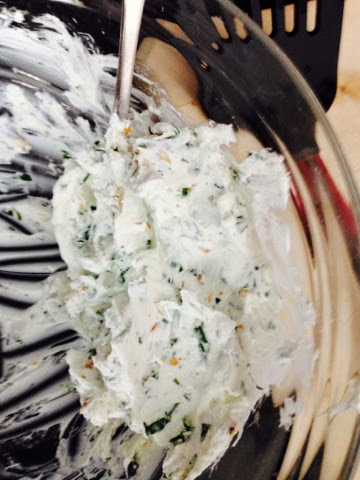 Place the chunks of salmon over the cream cheese making a slight dip in the middle for the egg then crack one egg gently into the dip. Place in the center of the oven uncovered for about 20 minutes or until the egg is cooked to your liking. Remove and let cool slightly then serve with crusty bread or pita for dipping. I also garnished mine with more chopped thyme. Dig in!